Now that the 2011 season has come to a crawl it's time to start thinking about 2012. While the winter months offer rest from the everyday hustle of being on the job site, it offers new challenges in the way of improving your company and making the upcoming year better and more profitable. 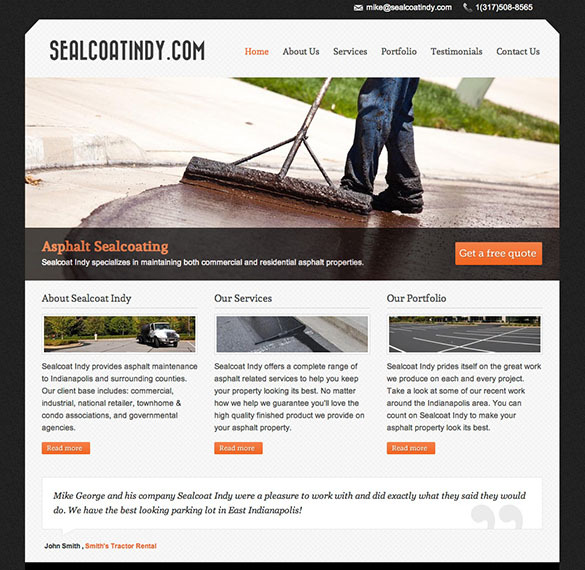 One of those challenges for many contractors this winter season will be planning and investing in a new company website. This challenge can be daunting because there is a lot to consider and a ton of decisions that have to be made in order to get the job done. And with spring just around the corner it won't be long before property owners will be searching for pavement contractors in your area on the internet. Here are 5 key factors to consider when planning for an effective website and web marketing program. 1) Attractive Design & Simple Navigation - First impressions matter. The easiest way to get a leg up on your competition and impress your prospects is by having a well planned and well designed website. If your website has a professional look and feel it will convey a feeling of strength to the visitor. If it is easy to navigate and find the answers they are looking for it will eliminate any friction (and therefore frustration) that would cause the visitor to leave and look elsewhere. When a visitor leaves your site because of a bad design, or inability to find information, they will continue to one of your competitors sites and you will have been eliminated from consideration. Therefore, It is important that your website really pops and stands out. At the end of the day the visitor should remember your website above the rest. Well designed websites cost more, but win over more prospects in the end. Don't cheat yourself, hire a professional! 2) Show-n-Tell - It's so important that you share your work and the positive feedback you've received on past jobs with your website visitors (see example above). Two great ways to do this are by having a testimonial and portfolio section. When your visitors see the quality work you've completed and read positive testimonials from people and businesses around your community it will add instant credibility to your companies name. It also shows that you are proud of your work and the relationships you have built. It shows you have satisfied customers who are willing to associate themselves with you and your company. These are two very powerful sales tools that -- when utilized correctly -- can turn "tire-kickers" into strong prospects before a first contact. It is also one of the more difficult areas of the site to keep fresh and up-to-date because it involves making it a part of your normal routine. However, If you will commit to setting aside a small amount of time for each job to take a few pictures and get a customer testimonial the pay-offs will be huge. 3) Fresh, Complete Content & Content Management System (CMS) - Whenever I go to a website filled with stale or incomplete content my focus changes from the reason I'm there (to look for a service/product) to wondering how a website could be so bad (and/or if the company is still in business). This creates the same friction and frustration mentioned in the section above. Eliminating the frustration someone could feel when they visit your website should be a key goal when designing and populating a web site with content. It's really important, therefore, that a contractor has complete information for each service offered, the about us page, contact us page, and especially the home page. Once your website is complete and populated with content ask a friend or colleague to go to the site and pretend they are searching for the services you offer. Their feedback will help you get it just right! (TIP: A knowledge base or frequently asked questions section is also a great way to built trust with your visitors. It can answer important questions and elevate your company to "expert" status before you say a word). Finally, it is critical that you have the ability to update the content on the web site yourself. 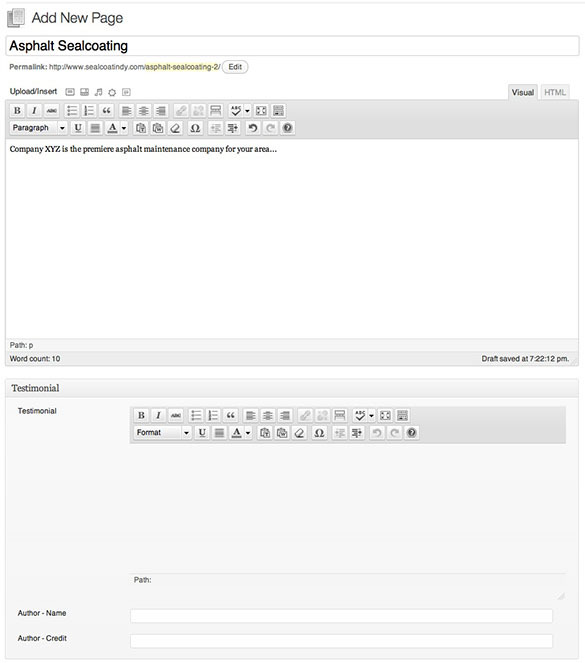 Most modern web sites these days have a content management system (CMS) built in. This CMS is a behind the scenes interface that will allow you to edit your website without the need of a third party webmaster (You can see an example of what the editor looks like above). It costs more to build a website with an integrated CMS, but you will save in the long run. Even if you don't have much computer experience you can learn to update your website quickly and easily. 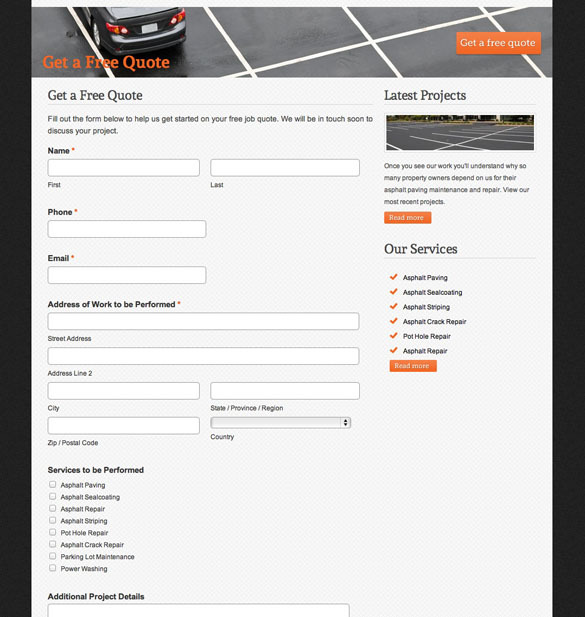 4) Contact / Free Quote Form - Picture your website as a funnel. If the top of the funnel is your homepage or page through which a visitor comes to your site, the bottom of the funnel is your "Contact Us/Free Quote" form (or a phone call). It is to the bottom of your funnel that you are trying to direct everyone that comes to your website. In fact it is the sole purpose you have a website. This goal is important to remember and should be evident everywhere. A well designed website will have buttons in prominent places that allow the visitor to access the contact us or free quote page from anywhere on the site. Having the phone number on every page is also a good idea. Bottom line, all of your website/web marketing efforts are directed towards making contact with potential prospects. It is important to impress, inform, educate and wow them, but if they don't contact you it doesn't mean a thing. This is a big one, so don't let it fall through the cracks! 5) Local Search Engine Optimization (SEO) - It is an absolute necessity that your web site be "optimized" for local internet searches. This should be a part of the web package you purchase as it is absolutely critical to the success of your website. It is also important that your website development team has experience in the area of search engine optimization, as there are many factors that must be considered throughout the development process. Some content management systems will also include interfaces that allow you -- or an SEO professional of your choice -- to continue working to keep your site optimized after it is complete. Note: Web site optimization can be an ongoing process and is not "over" once the website itself has been built. Ask your web developer to explain SEO and how it works. Conclusion - A recent survey found that 93% of business to business purchases begin online. This is important because your website will often times be the first opportunity to impress potential prospects. Unfortunately, many of these "potentials" come and go without your ever noticing -- and so it also becomes your last. Having an effective website that is optimized for search engines makes all the difference. As you contemplate and begin the process of planning your company website, keep these 5 factors in mind. If you would like to share other important factors that you feel help make an effective website -- leave your comments below! If you have any questions about the article or about websites for pavement contractors in general please feel free to get in touch @ brett@wtalkie.com. Brett Neal is the director of Pavemanpro.com and owner of Walkie Talkie Marketing Communications, LLC. 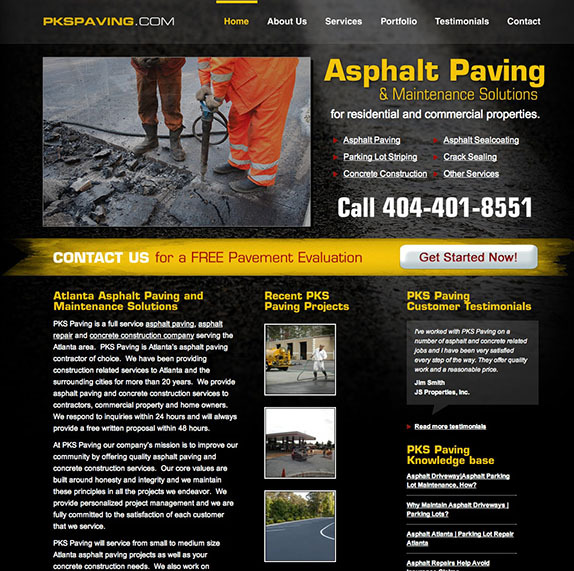 Walkie Talkie builds custom websites for pavement contractors. 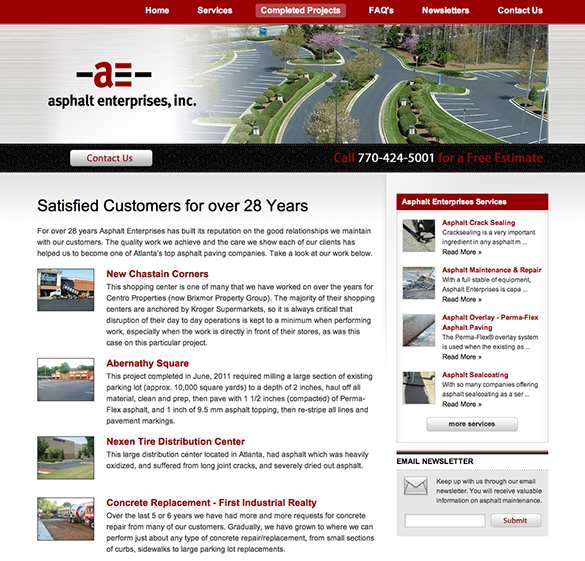 Brett has been a marketer in the Pavement Industry for over 20 years. You can visit the website to learn more at www.wtalkie.com.